ARMENIA, Cilician Armenia. Royal. Levon I. 1198-1219. AV Half Tahekan (19.5mm, 2.46 g, 11h). Levon enthroned facing, holding cross in right hand and branch in left / Patriarchal cross flanked by two lions, heads reverted. Nercessian, Gold III.a (this coin); AC 255 (this coin illustrated); Bedoukian 6 var. (rev. legend); Friedberg –. EF, toned. Extremely rare – the only example known to Nercessian. From the collection of Dr. Lawrence A. Adams. Ex J.G Collection (sold as the “Araratian Collection,” Classical Numismatic Group 36, 5 December 1995), lot 714. 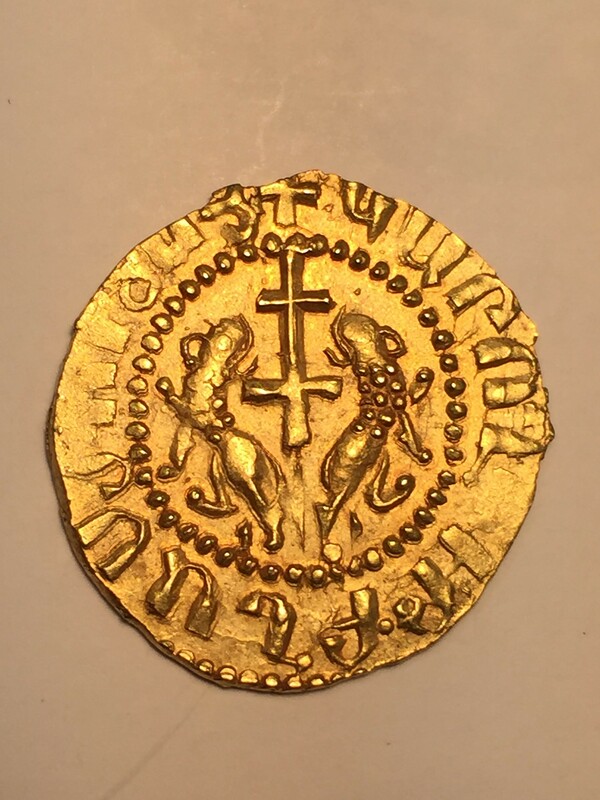 Obviously, someone felt it was a genuine, rare coin Armenian Cilician gold coin. A true treasure. It is Chuck’s opinion that the coin is real. It was examined in person by myself and I took the pictures. Discussion is good for the Numismatic SOUL. If you wish to add comments, send them to us. This coin has been hotly debated as to it’s authenticity. Y. T. Nercessian calls it Genuine. 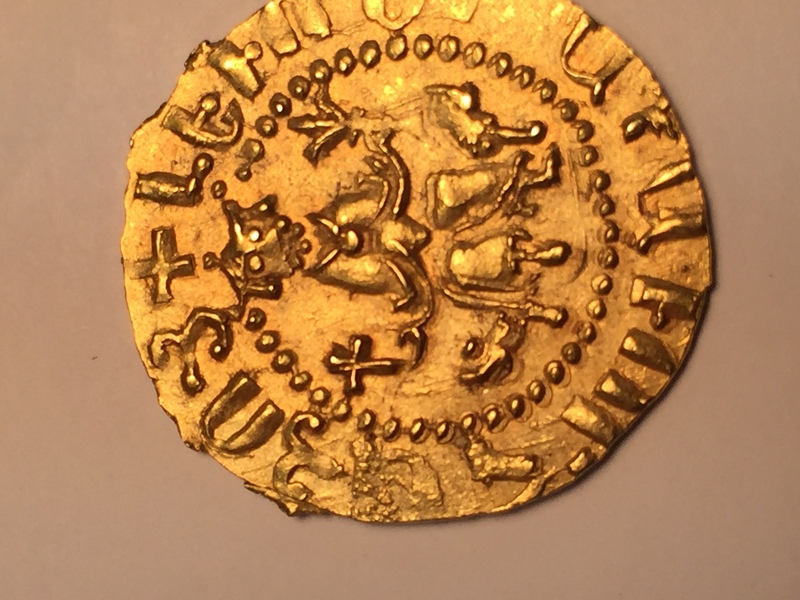 He has examined the coin, corresponded with the source of the coin– they speculated about a hoard of Egyptian gold, Italian gold, Seljuk gold and others. Shown the piece to the Metcalfe, Chief Numismatist at the Numismatic division at the Ashmolean Museum at Oxford University who called it authentic. Here is my theory. I am keeping an open mind. I have over 35 Smpad ‘coronation’ silver trams. 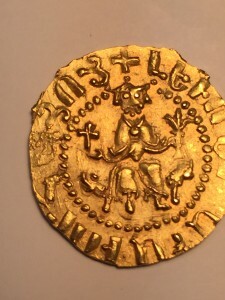 Many are coins with the same style helmet on the king and identical pendilia as the gold, and generally very similar style of lettering and dress. But all of these particular silver coins are named SMPAD, and they all seem to have annulets in the field. The golds are of course LEVON and do NOT have annulets. On both silver Smpads and Levon golds HAYOTs is spelled HAYOY. I think many golds may have been struck but captured (see Vartan Areveltsi) soon after and carried off to Egypt very shortly after striking, or melted. The two we know of were thus not presentation pieces but struck for circulation, hence rusty dies and striking imperfections. I can see evidence of die cracks, die corrosion, and double striking, all of which are indicative of authenticity. Nercessian received a letter from Schulte of M&M Basel with detailed information about the hoard these 2 coins were found in. The hoard is dated ca. 1298, and the piece being sold now was originally held back by the owner but later sold thru Sternberg. This info is in ArmNJ. As a quick two cents, I too think the gold coins bearing the name Levon are not genuine. A bunch of good points have already been made on this thread, but I’ll put in another one. If I’m a king issuing rare gold coins (and these are obviously very rare, as explained by Jirair), I would make damn sure that these are stunning and flawless. However what we see is a small set of imperfect gold coins, especially the one currently on sale. Levon III has well made coins, even had “distinct facial features” clear enough to help link those Levon I “coronation” or kneeling coins to him. You really think that this guy would allow such poorly made gold coins to be issued in his name? I don’t think so. Just like Levon V., I believe the Gosdantin I golds to be genuine, however, I am 99% sure there are not Gosdantin I. I think they belonged to Gosdantin IV, and I believe I’ve sent an email once explaining why. In short, the country was almost gone, he needed a boost of some sort, gold coins would be an example. He claims to be the ruler of Sis, which was the only thing left in the country by G IV. He most probably displaced Levon the Usurper (making himself in fact an usurper), erased his legacy and issued a gold coin with him appearing as a conqueror and claiming to be the ruler of Sis. Also the quality of work isn’t perfect, as we see on other coins of G IV. Gostandin I coins are perfect, event the copper ones, I would expect his golds to be photographic. Just a theory, but it’s much more believable, at least for me. I think those Levon golds were struck in 19-20th century. Somebody must’ve found Cilician dies and struck some gold with them (probably a few silvers as well). I believe you are walking on thin ice when you are condeming a coin without seeing it in hand. The CNG coin is in a fresher state than the other. 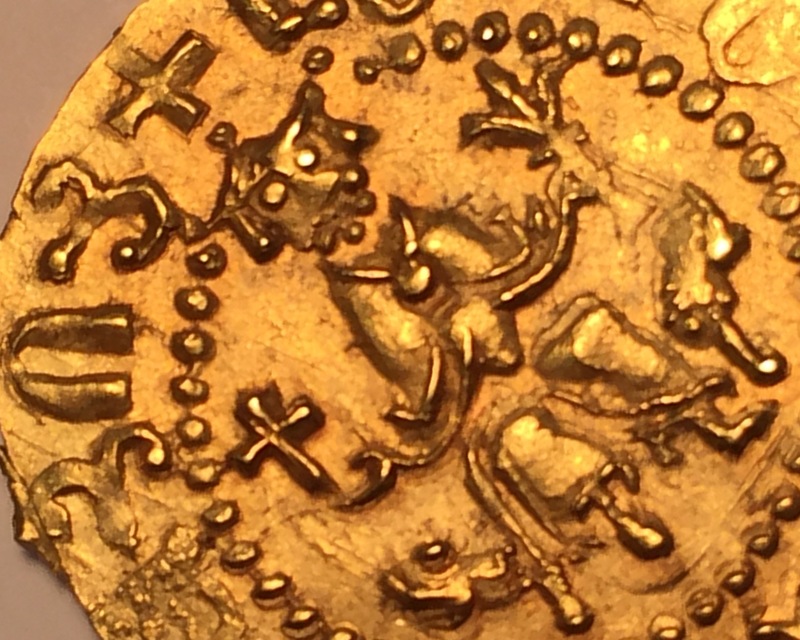 If you look at the legends on the Kunker coin they have spread a bit which is constitent with any striking in medieval coinage . 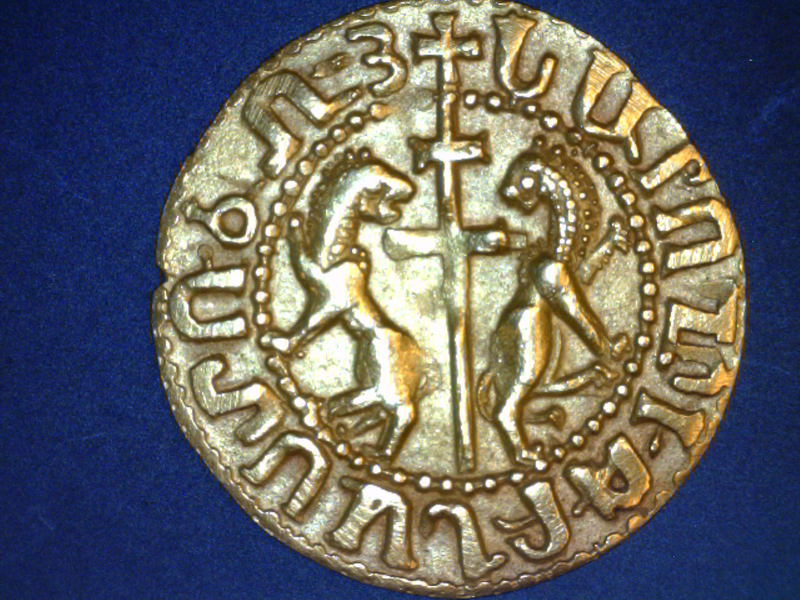 The style of the coin does not belong to Levon I; it suggests Levon III or IV. I have in my collection trams of Smpad and Levon III that must have been engraved by the same hand the only difference the name. If I were a forger I would make a copy after the style of Levon I tram not a coin that did not exist and of a style of about 100 years after Levon I . If they are both struck fakes then they are the work of a very clever forger. I think both coins are genuine based on the photos. We know oddity in Cilician struck coins exists. Some examples are Levon/Hetoum and or Levon/Smpat trams. Most of these kings had short reigns. Chances are some of the engravers continued their work under different kings and used mismatched names/dies for reasons open to speculation. Odd and unique coins surly get our antennas up but by no means should be a cause for quick condemnation. Creating doubts about such coins will make them toxic orphans to the collector community. That I find it wrong. Unless really proven otherwise. Just by looking at the picture, the gold coin on CNG looks struck and lucky is the person who will get to see, feel and examine it in hand. To me it seems strange if Cilician kings had never struck any gold coins. Others question the following: “why haven’t more come forth if they were minted in fair qualities? Only about 16 are known. Ruben Vardanyan, the head of the Historical Museum of Armenia, numismatic department, has written extensively as to why he considers them late 19th century and mid 20th century fakes. ANJ about 2 years ago. Some feel it is not Levon the I but was issued by Levon III. Others feel it was a fake based upon a genuine coin of King Smpad. The only possible explanation I see towards these coins being genuine is if they were issued as a coronation/presentation piece, and then by Levon III (but as he was a child, ruled for a short period, and mostly under a regent, even that seems improbable). I believe that to strike coins in these tiny weights/denominations would be impractical and a waste of a lot of effort at best, especially if there is no established precedent for doing so in Cilician Armenia, so it makes less sense than ever at the beginning of the 14th Century, when the kingdom had lost much of its wealth and was under attack from multiple fronts. 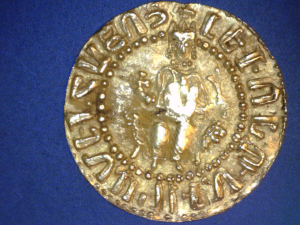 I also don’t believe in the concept of a king of Cilician Armenia striking coins in the name of another (in this case, Smpad, whose likeness appears to be the one we see on these gold coins, but in the name of the founder of the kingdom Levon I). This is not Parthia, where the name of Arsakes was immortalized and frozen for centuries of coinage. In these troubled times, every king needed legitimacy through proclamation of HIS own name. Think of the message on Gosdantin I’s coinage, the copper and silver, not to mention the sole genuine gold issue of the kingdom (undoubtedly not a circulating currency, but a coronation/presentation issue?). Think of even the “pre-coronation” issue of Levon II, where he used the design and portraits supposedly of his parents. Why could that not be his own portrait, with his wife Keran? We have a beautiful illuminated portrait preserved of the young prince and his wife. I proposed that’s them on those coins inscribed LEVON, and not his parents Hetoum and Zabel. You can store value in ingots, scrap, or even the foreign currency you obtain it in. But why go through the trouble of melting it and striking new coins (tiny ones at that! ), especially if there is some “political/propaganda” value in the design? That only makes sense if it is meant to be passed to people who then experience it in their hands. Levon S observed “rusty dies and striking imperfections… evidence of die cracks, die corrosion, and double striking, all of which are indicative of authenticity”. Those details may be evidence of striking, but not necessarily of authentic medieval striking. If these were in fact struck in large quantities, and used in circulation, we would have many more reported specimens, and from multiple dies. Two from the same O & R dies makes it less likely to be the case, especially if one has dies that rusted in the meantime. 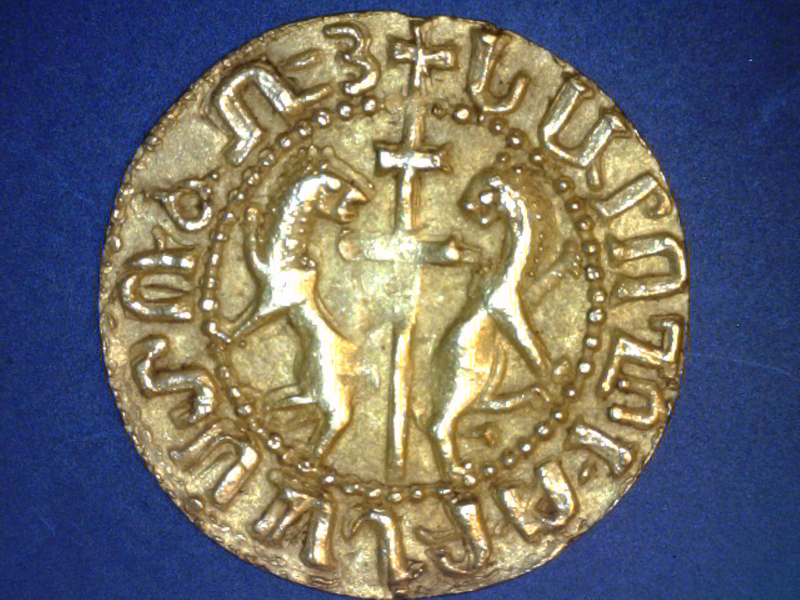 Also, the term “tahegan” was interchangeably used for silver and gold coins, according to Bedoukian (to counter the argument that certain historical accounts mention tens of thousands of “tahegans” being paid in ransoms; or, alternatively, even if meant for gold, they could have referred to a foreign gold coin used in local commerce, e.g., the Venetian ducats – see below). Furthermore, there is no chance, in my mind, that all the rest would have been plundered and melted, and have disappeared forever. 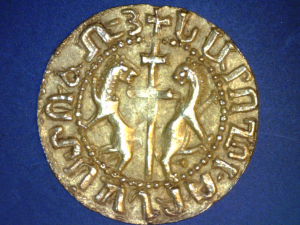 Collectors of medieval Armenian coins are constantly offered rare coins by dealers from around the world. Yet none of these is gold. There are over 100 medieval Armenian sites preserved in some form in Cilicia, from fortified cities to fortresses, fortified estate houses, monasteries and settlements. Every single one of these has probably been the target of some metal-detecting treasure-hunter activity and damage in the past 50 years. Yet, again, none of this activity has apparently yielded any gold coins, while rare baronial coins often come up, selling for $1000 and up. If those miserable-looking coins are recognized as rare and valuable, would gold ones not be offered alongside them? And then there is the issue of metrology. I was unsure of how the die/coin size & weight would relate to proving/disproving these coins’ authenticity. These coins are slightly smaller than typical trams. However, they don’t show the outside circle of dots, meaning that they were struck on flans smaller than the full dies. Some of the trams (of either Levon I, Smpad, or Levon III) are similarly struck on smaller flans. But, measuring the diameter of the INNER circle of dots (from published images of the Levon “half-tahegans”, O: 13mm, R: 12.5mm) indicates that their dies were probably of a generally similar size to those of Smpad trams. The possibility of a Smpad tram having been the prototype for a forger has been mentioned, due to similarities between some of them and the rendering of the king and reverse cross on these “half-tahegans”. But why would a forger have changed the name? Also, one of the Smpad trams bearing the name of Levon on the obverse and Smpad’s on the reverse has been mentioned as a possibility. But even that seems improbable to me. The most likely prototype, in my view, for a forger, would be one of the trams previously attributed to Levon I, which Ruben Vardanyan (correctly, I believe) attributed to Levon III, as part of the D class that Metcalf had also previously identified. A few of these dies have a patriarchal cross on the reverse. I suggested that Levon V take a picture of his beautiful Levon III tram next to the “half-tahegan” at NYINC for comparison and scaling. On the other hand, I realize that the use of a very rare coin’s dies as prototype for a forger would seem unlikely. Tens, if not hundreds of other common coins would have been more likely candidates. 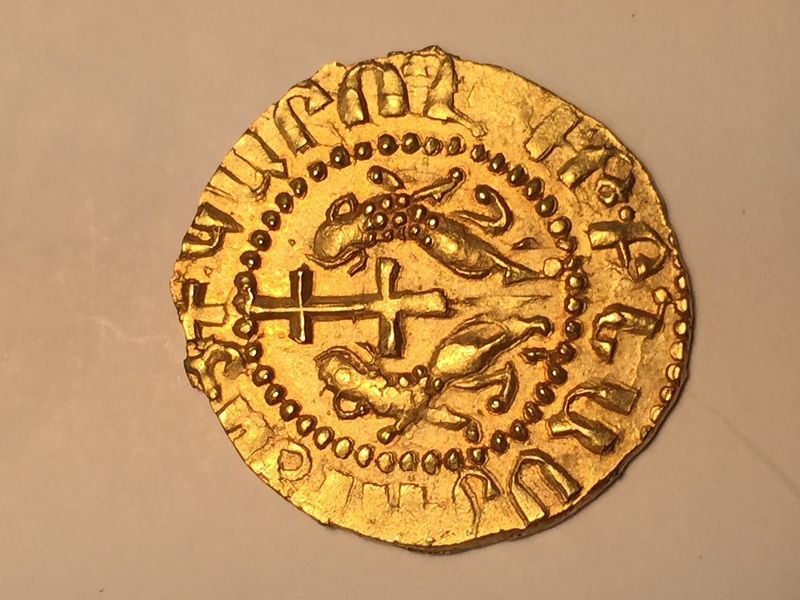 But, once again, we seem to have a relatively rare die used in making another fake gold coin, on the obverse of the Levon-Hetoum “tahegans” (ACV 315). We also need to consider the weight of these “half-tahegans”. How does it compare to the weight of Gosdantin I golds? Is there a correlation with them, and more importantly, a correlation with the weight of any other contemporary gold coinage in the region? Even if these were a limited donative or coronation issue (of Levon III, which is the closest I can come to making them a genuine medieval issue, as they share many characteristics with the Levon III trams (those previously known as Levon I D-Group trams), they would have to fit some standard of weight for other circulating contemporary gold coins. Randomness on matters of such importance would not be expected, since the design follows that of a coin, and these are not mere medals. These seem odd, compared with the 3.6 g = Gosdantin I tahegan (ACV 414). 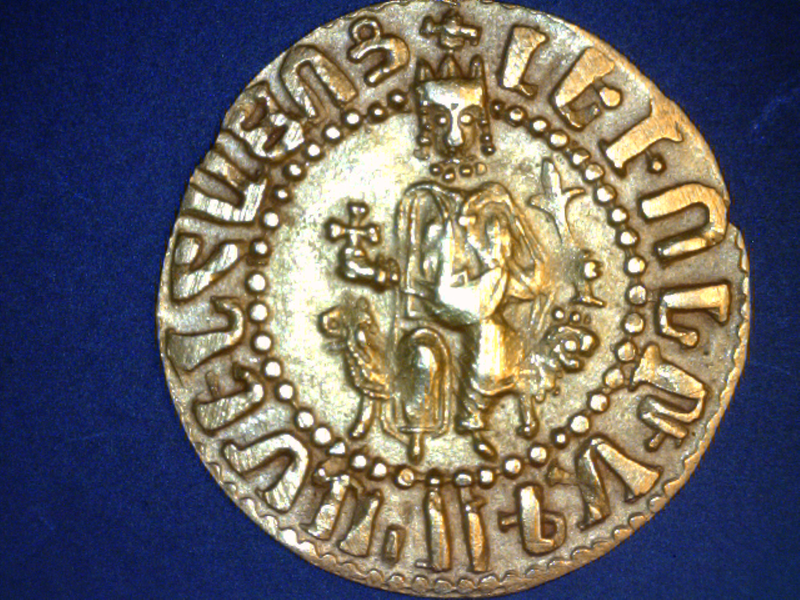 · An Islamic dinar weighed nominally 4.25 g, though Mamluk dinars were currencies of account, and actual circulating dinars issued were of varying weights, with Syrian mints under al-Nasir Muhammad (ruled 1293-1294, 1299-1309 and 1309-1341) striking them in the 5.2-6.8 g range. 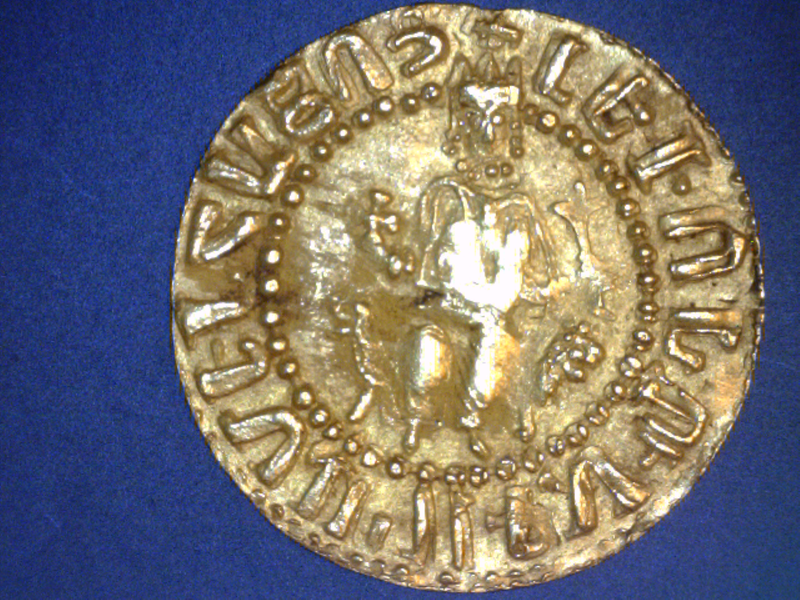 · An Islamic dinar of the Seljuks of Rum seems to have a had a much more controlled weight, in the middle of the 13th C, ranging from 4.4 to 4.68 g (per CNG sold coins). These being struck in Konya, among other mints, they were possibly the gold coins struck geographically closest to the Cilician Armenian kingdom. On the other hand, I don’t think they struck any gold after ca. 1250 AD. 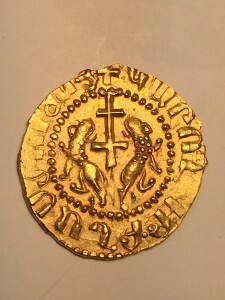 · Venetian ducats of the contemporary doge, Pietro Gradenigo (possibly the most common gold coins in circulation in Cilicia at the time), weighed a nominal 3.5 g (which, incidentally, is very close in weight to the Gosdantin I tahegan, perhaps indicating that this currency would be a more likely “standard” than the Mamluk or Seljuk ones for the Armenian kings to have followed in striking any gold). I don’t exclude these being genuine issues, though I have never held one in hand, and based on the above, find their size and weight to be out of synch with what I would expect, something more closely matching a full dinar/ducat weight, or the half of one. 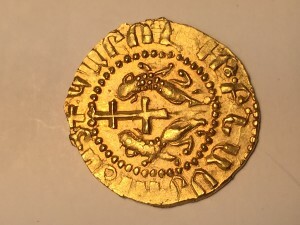 As it stands, the average weight of the two “half-tahegans” is 2.335g, which is 0.667 (or two-thirds) of the 3.5 g Gradenigo ducat, not a common fraction. On the other hand, these would have weighed about one-half the weight of a Seljuks of Rum gold dinar. And, finally, if we consider the widely-varying weights of the Mamluk dinars, any weight would work here for the Armenian “half-tahegans”. Here are actual FAKE Levon the First Gold Coins. note the “omega” at 11:00 on the reverse. The nose has the typical “Goon” bulbous shape . One of these coins actually is shown as real in a museum in Detroit as late as 2013.